Billy and Mary Kennedy, 2016. Photo by Matt Sachs, TexAgs. Men’s basketball coach Billy Kennedy joined Texas A&M in 2011. He is fighting Parkinson’s and had faced much criticism of his abilities. 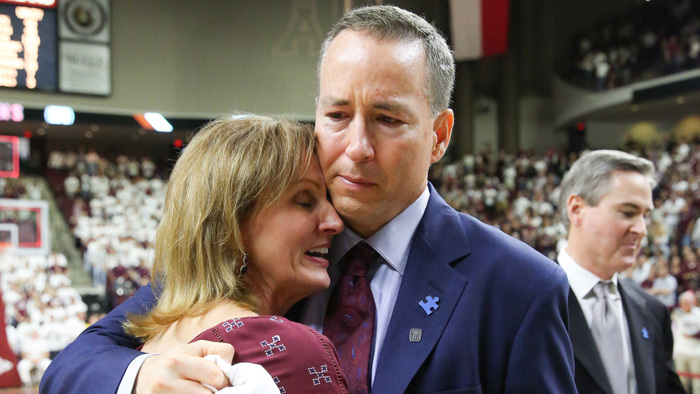 Pictured are Coach Kennedy and his wife Mary Kennedy immediately after his men’s basketball team won the SEC regular-season conference championship for their first time in 30 years. Our first GSA-Art post is by Matthew S. Sachs, a Professor in the Department of Biology at Texas A&M University and a sports photographer. I began photography in high school. My imagination was captured by the great Magnum photographer Henri Cartier-Bresson and his concept of the decisive moment; Fred Picker’s Zone VI Workshop, which described the concepts of exposure used by Ansel Adams’ school of photographers, fired my interest in perfecting technical approaches for capturing reality. The darkroom was my first lab. 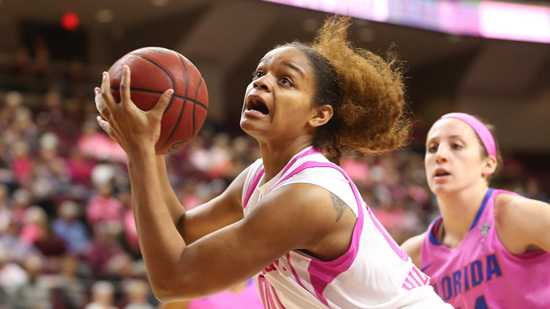 Texas A&M center Khaalia Hillsman controls the offense against Florida in the annual BTHO Breast Cancer game, 2015. Photo by Matt Sachs, TexAgs. As an undergraduate I was a Cornell Daily Sun Photo Night Editor; after shooting events I would work intensely inside the darkroom to produce prints, while the writers and editors worked intensely in the newsroom outside. My career interest was biology, however, and I turned down an offer to be the Sun’s Photo Editor in Chief and an overture from United Press International to join them as a photographer after graduation. I maintained my interest in photography and while in the Pacific Northwest at Oregon Health & Science University began actively— and professionally— photographing dogs and handlers in the sport of dog agility. My images were published regularly in the sport’s magazine Clean Run; the design editor would look at my events website for images she wanted to use, and ask me for them. This brought me back to sports journalism. I moved to Texas A&M University in 2007 and in 2009 I began photographing Texas A&M sports for TexAgs.com, a popular independent website that focuses on Texas A&M athletics. 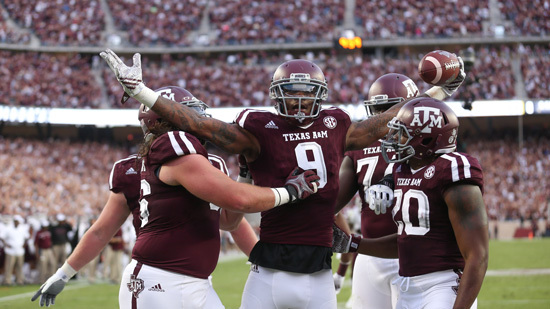 Texas A&M wide receiver Ricky Seals-Jones celebrates a touchdown reception, 2015. Photo by Matt Sachs, TexAgs. While I appreciate all kinds of photography, ultimately for me it is about emotional content—the sentience of the subject. It follows that, in addition to images possessing vitality through elements of composition, many of the images to which I am drawn have expressivity that radiates from eyes and faces. For me, sports photography is portrait photography. Another photographer also captured this moment and it became quite popular. This is the story of Cadet Ivey. My laboratory’s research focuses on post-transcriptional control mechanisms, particularly the functions of upstream open reading frames (uORFs) important in controlling gene expression. We discovered that expression of a fungal arginine biosynthetic enzyme is regulated by the uORF-encoded nascent arginine attenuator peptide (AAP), which stalls ribosomes on its mRNA in response to arginine. AAP is currently the best understood regulatory eukaryotic ribosome arrest peptide and has revealed much about the processes of translation, translational control, and the nonsense mediated mRNA decay (NMD) pathway. Among our current projects, we are studying the mechanisms of distinct branches of NMD, translation initiation and elongation from canonical and noncanonical start codons, and are collaborating to find novel compounds that affect translation. In collaboration with Dr. Deb Bell-Pedersen (Texas A&M) and others, we are also using systems-based approaches to understand transcriptional and translational control mechanisms that underpin responses to light and establish circadian rhythms in gene expression. 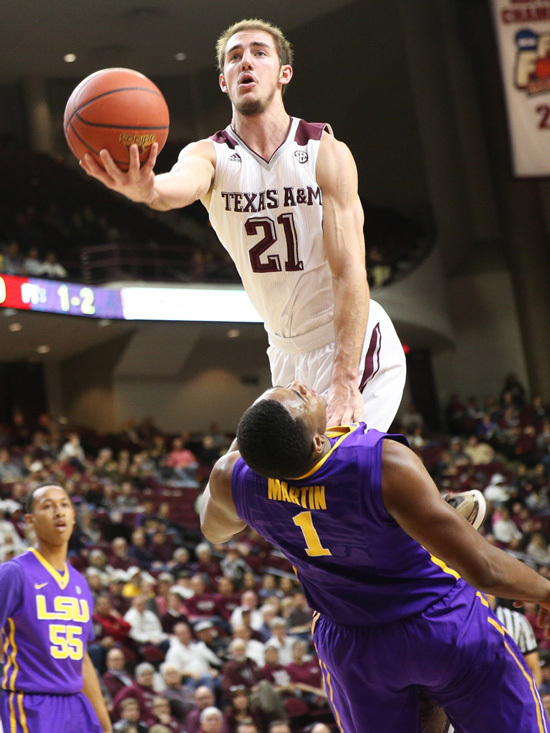 Texas A&M guard Alex Caruso goes over LSU forward Jarrell Martin, 2015. Photo by Matt Sachs, TexAgs. 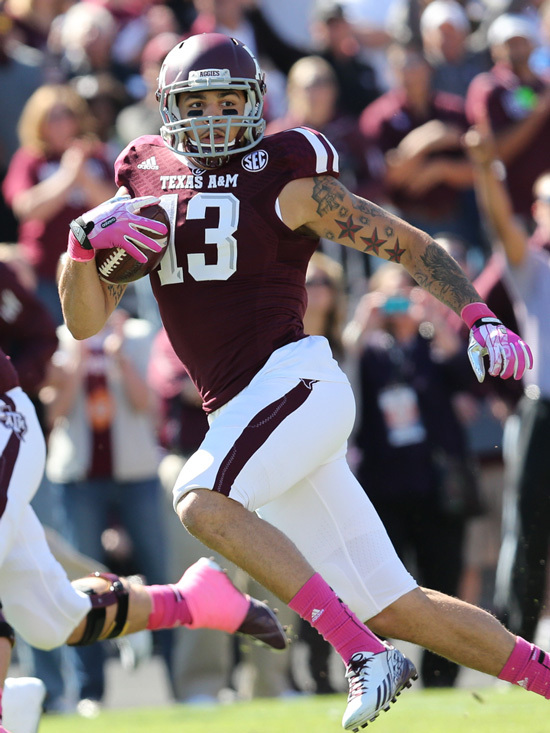 Texas A&M wide receiver Mike Evans streaks downfield after a reception, 2013. Photo by Matt Sachs, TexAgs. 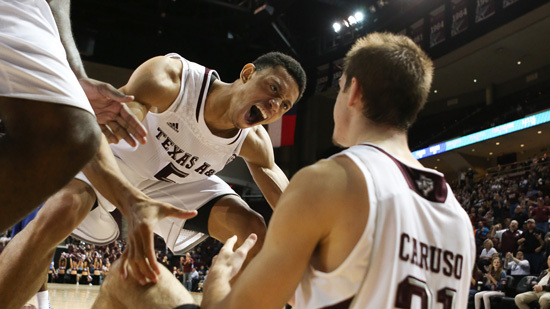 Texas A&M guard Jordan Green gives a hand to Alex Caruso after a successful hard play at baseline, 2013. 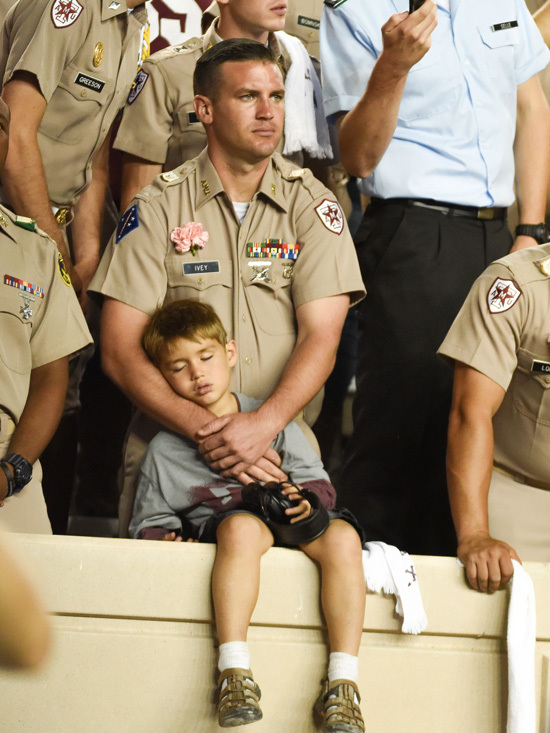 Photo by Matt Sachs, TexAgs.